IBM Lift makes it easy to quickly, securely and reliably migrate your database from on-premises data centers to an IBM Cloud data property. It enables secure and rapid migration to the cloud with zero downtime. Take your entire database to the IBM Cloud. It's a two-step process: convert your schema and migrate your data. To convert your schema, start by downloading the IBM Database Conversion Workbench. The workbench will walk you through the process of converting your source database DDL so that it is compatible with the target. The workbench will also produce a report that tells you where your action is required. Once your schema is in place, you'll use the Lift CLI to migrate your data. Start by generating a set of CSV files that represent your incremental changes, per database table. 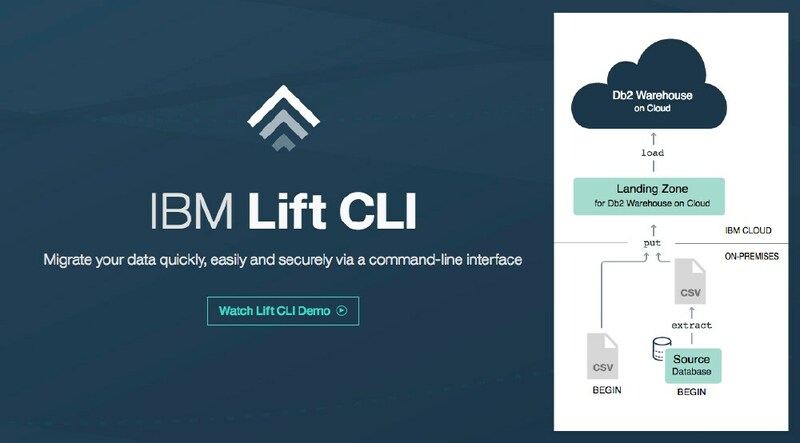 Use the Lift CLI to scoop up those delimited files, push them over the wire, and import the files into IBM Db2 Warehouse on Cloud. Throw these steps in a script, set up a cron job, and you've got an ongoing incremental update of your data warehouse. You can use the Lift CLI to migrate data from multiple different databases or data sources into a single IBM Db2 Warehouse on Cloud MPP cluster. Lift provides you with the flexibility to take tables from multiple data sources and import them under a single schema in IBM Db2 Warehouse on Cloud so that you can decommission your existing database cluster. Your customers don't care that you need to run analytics on their buying behavior. They just want a snappy user experience. Spin up a cloud data warehouse, such as IBM Db2 Warehouse on Cloud to run analytics on data from your transactional data store. Keep your reports and dashboards up to date by sending small amounts of data from the source, and always have an up-to-date view of your business. Lift uses IBM Aspera under the covers to move your data to the cloud at blazing fast speeds. Aspera's patented transport technology leverages existing WAN infrastructure and commodity hardware to achieve speeds that are hundreds of times faster than FTP and HTTP. Automatically recovers from common problems you may hit during the migration. For example, if your file upload is interrupted mid-transfer, Lift will resume where you last left off. File uploads are stable and robust, even over the most bandwidth-constrained networks. Nobody wants to end up on the front page of the news. Any data moved over the wire to the IBM Cloud is secured via a 256-bit encrypted connection. Every data migration is split into three steps: extract from source, transport over the wire, and load into target. Our CLI gives you the flexibility to perform these three steps separately so that your data migration works around your schedule, not the other way around. You'll install the Lift CLI only once on your on-premises machine. Under the covers, the CLI works with the Lift Core Services running in the IBM Cloud to help get your data to your Watson Data Platform persistent store. Like any other cloud app, Lift never requires an update. New features are instantly available to you without you having to lift a finger. We want you to try our cloud data services. Cost shouldn't be an issue. Get help from IBM experts. A fully-managed SQL cloud database. Easily deploy and scale on demand. Advanced capabilities of IBM Db2 with the agility of a cloud deployment – all under your control. Do data science faster with IBM Integrated Analytics System. An optimized and cloud-ready data platform that connects data scientists with data. Get started with data migration in minutes.